Friday and Saturday shows at 7:30 p.m.; Sundays at 2 p.m. 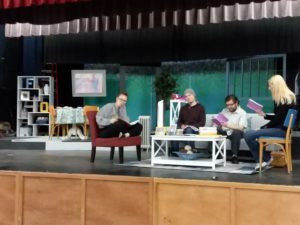 THE CAST IS ANNOUNCED! Click here. Tickets now on sale online. Click here. THANK YOU TO EVERYONE WHO CAME OUT FOR OUR FIRST TWO SHOWS!!! The cast is announced! Details here. It’s your big opportunity! Volunteer with the Black Swamp Players and help make our 51st season a success! We’d love to hear from you in our online survey. We need volunteers with many different types of skills, abilities and amounts of available time to produce live theater. Whether you click “Yes” to many or just one of the following questions we are grateful to have you. Thank you. Click here to take the survey. And thanks a million! !